J.P. Cregan-Elba. JP Cregan's 2009 debut Man Overboard was one of the more pleasant surprises of that year, placing #12 on my year-end list. Now he's back from exile with his followup full-length Elba, and serves proof the debut was no fluke. Opening track "Wreck" is a great slice of melodic pop which practically swings with its playful guitar riff and horns, "Here it Comes Again" is straight ahead power pop in the Cliff Hillis/Michael Carpenter vein, and "Saw Her on the Metro" has enough of a wall of sound that it recalls a Jeff Lynne production. But in addition to the traditional power pop sound, Cregan moves into foik/rock territory on a few tracks, including the winsome acoustic-based "Susie, Please" and the near-rockabilly of "I Want to Let You Know". This is definitely another strong candidate for the year-end Top 20 in what's shaped up to be a very strong year for power pop. 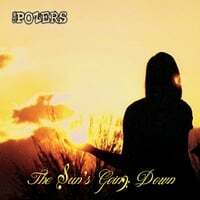 The Pozers-The Sun's Going Down. Another artist unveiling their sophomore effort is The Pozers, whose debut disc Embrace Your Addiction got quite a bit of love in power pop community back in 2004 before yours truly got immersed in the scene, and on the basis of their fine newly-released followup I'm going to have to back and check that one out. As for The Sun's Going Down, it's a tour de force of power pop styles produced by none other than Roger Manning. The fuzzed-out guitars of "Spacecar" answer the question of what Guided by Voices would have sounded like in 1968, the loping yet melodic "All She Wrote" could pass for a lost Nuggets classic, and "The Separation" expertly evokes Pet Sounds-era Beach Boys. They may be retro, but when you get retro this right you can't be wrong, and that's no pose. One of the more welcome annual traditions in the power pop community is the release of David Bash's International Pop Overthrow compilation, guaranteed to be 3 CDs of top-shelf power pop with new tracks from old favorites and a wide variety of tracks from up-and-coming power poppers. Volume 15 is no exception, including many artists who have been featured on these pages such as The Condors, Private Jets, Clockwise, The Foreign Films, The Afternoon, Vegas With Randolph, Throwback Suburbia and The Shamus Twins. But it's the new discoveries that make these compilations special, even for those who consider themselves well-plugged in to the scene. Disc 1 starts off, however, with one of the genre's icons. As most of you know, Shoes are back with the first album in ages and the fine "Head vs Heart" is one of the better tracks off their highly recommended return, Ignition. Among the lower-profile artists, the standouts here include the Stonesy rawk of Marvin Etzioni's "The Grapes of Wrath", Fireking's jangly "So You Say You Lost Your Baby", the Who-like power chords of The Seasongs' "New Love" and the 60s pop of "Yesterday" by The Secrets. Disc 2 opens with the harmonic, melodic pop/rock of King Washington's "The Gears", and The Sunychmes' "Revelations in Her Mind" is a great introduction to their 60s California sound found on their latest disc, Let Your Free Flag Fly. Other treats include the Brill Building pop of "The Coast is Clear" from The Housekeeping Society, Norman Kelsey's 70s R&B-influneced "On the Rebound", and the 70s AOR of "No One to Blame" by the wonderfully-named Salvador Dali Llama. Disc 3 features the great retro-pop of Portland's The Cry ("Modern Cinderella") and the Beat Rats ("Only 16"), the trippy psych-pop of The Pondhawks' "Drive", some fine Popicana from the (unfortunately-spelled) Pengwins in "Naive", and the bright 60s pop of The Airwaves' "Miracle". And things close on a high note with Ed Tulipa's "Barbie", a catchy midtempo Beatlesque tune. These IPO compilations always make a great holiday gift for the power popper on your list, and not a bad present to buy yourself. Bondo Camaro-Bondo Camaro vs Any Mammal. It's been quite awhile since we heard from Arthur Yoria (2007 to be precise) but he's resurfaced as part of Bondo Camaro, a LA band that's kind of grunged up his pop sound but left the melodies intact on their debut EP. Opener "Chemistry" gives us the formula for what's to follow, distorted guitars in the background with a sweet power pop melody, reminiscent at times of Matthew Sweet or a fuzzed-out Teenage Fanclub. 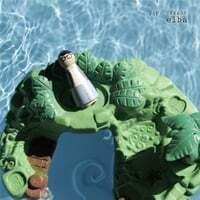 "Put You to Sleep" is another standout as it asks the question "Is there such a thing as stoner power pop?" and answers "yes". This is probably nothing like anything you have on your music player of choice at the moment but you'll want to remedy that right away. Exclusively on Bandcamp right now. The Condors-3 Item Combo. Speaking of artists we haven't heard from in 5 years, here are The Condors with the long-awaited followup to... Wait for It. This time around it's more garage pop than garage rock, with excellent results. "Here I Go" and "Slice of Life" are almost jangle-rockers, while "Queer Fascination" brings The Grip Weeds to mind. Elsewhere, "Holiday" has a Smithereens feel to it and "Seraphina Way" is a pleasing midtemp rocker. 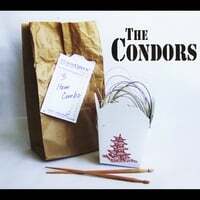 With their old-school power pop sound, the Condors may hail from LA but they sound like New Jersey.